Simple and elegant, that’s what best describes this Jet Black BMW E82 1 Series project. 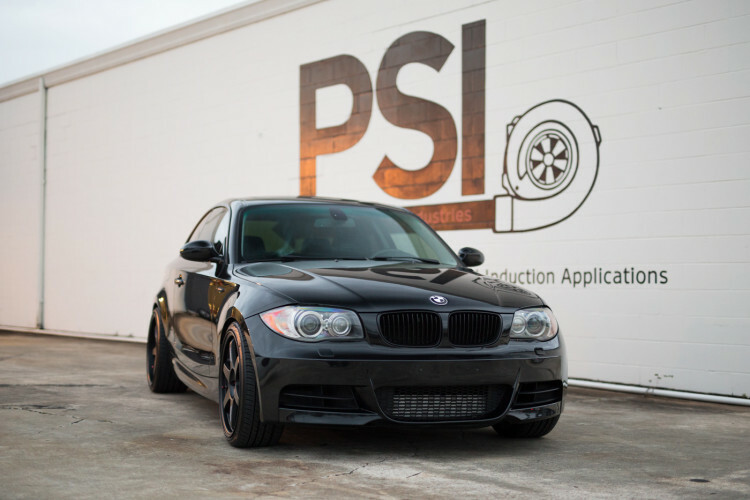 Modded by Precision Sport Industries, the 1er Coupe features a set of VOLK Wheels and a lowering spring, to give the coupe that extra sporty look. These wheels are a novelty on BMW builds, as they are primarily set up for Japanese style project and drift-type projects as well. They give a bit of an exotic look to the 1 Series, which is seldom seen on such builds. Released in 2006 the BMW 1 Series of this generation, proved to be a highly successful model for the company. According to BMW, the 135i Coupe accelerates from 0–100 km/h (62 mph) in 5.3 seconds, making it a remarkably nimble, performance oriented and highly dynamic coupe. However, Car and Driver recorded 4.7 seconds for 0-60 mph acceleration, combined with a quarter mile time of 13.3 seconds at 106 mph (171 km/h). Top speed is electronically limited to 250 km/h (155.3 mph). Fuel efficiency is 18/25 mpg-US. For further details on this wheel setup, please take a look at the media gallery we’ve added right below! Enjoy!